Brave Sussex batted for their lives while Kent’s bowlers toiled fruitlessly under the sun as the two neighbouring counties fought out a high-scoring Specsavers Championship draw in Tunbridge Wells. Following-on some 242 runs in arrears at the start of the final day, Sussex lost only five wickets in the three sessions and had edged into a 13-run lead courtesy of Ben Brown (25*) and Chris Jordan (7*) when the sides shook hands on a draw just before 6pm. Kent banking 11pts to Sussex’s 8pts. 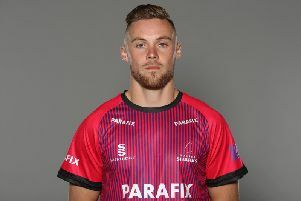 Though his side failed to hammer home the advantage they held over all four days of the match, Kent’s Sam Northeast remained phlegmatic. “After all that effort and our bowlers sending down well over 200 overs in the past two days you want to win, but they were such tough conditions,” said Northeast. Facing a backs-to-the-wall fourth day after being dismissed for 333 on Tuesday, Sussex suffered only one casualty in the opening session when their former skipper Chris Nash went for 18. From the opening ball of the day Kent applied scoreboard pressure from both ends, sending down nine maidens in the first 16 bowled, before Nash departed in the 28th over of the day after miscuing a drive against left-arm spinner Imran Qayyum to Sam Northeast at short extra-cover. Kent had taken the new ball through Kagiso Rabada whose effortless action generated good pace, but with little or no luck. The South African had two concerted lbw appeals turned aside in another eye catching stint of 6-3-8-0. Left-arm spinner Imran Qayyum and off-spinner James Tredwell bowled in tandem with five close men around the bat, but were denied another breakthrough as Sussex lunched on 62 for one. Despite the break Kent still found wicket-taking an issue on a slow pitch offering a modicum of slow turn, and were restricted to a further two wickets in the mid-session. Harry Finch (66) posted a 133-ball 50 before he push-drove to short extra cover off Tredwell, then Luke Wells (22) mistimed a drive to give Qayyum a return catch. Taylor, in his final four-day appearance for Sussex and fresh from a first innings 142, counter-attacked realising the importance of his side edging ahead in terms of runs to post 68 either side of tea. Kent pushed to the limits through Mitch Claydon and Rabada for a new-ball breakthrough, but luck was against them. Claydon’s in-duckers beat the inside edge only to miss the stumps on numerous occasions while Rabada’s stint of nought for 33 fail to reflect the numerous times he passed the bat and had lbw shouts turned aside. Taylor rode his luck a little, he was dropped at long off by Qayyum and then Kent’s stand-in keeper Callum Jackson grassed a tricky stumping chance, but otherwise the one-time Blackcaps skipper ensured his side would go home with a draw. With the game almost safe, right-handed Taylor holed out to cow corner to give Tredwell a second wicket, then Luke Wright (38) played back and down the wrong line to go lbw and give the former England spinner figures of three for 76 when stumps were drawn. In praise of his overseas professional, Sussex captain Luke Wright said: “Ross has been awesome the whole way through and we’ve relied on him a hell of a lot. I’m pleased to see him finish with two good scores that got us out of trouble. Wright added: “Once we finished on the wrong side of the toss we knew it was always going to be a hard game, particularly going into today following on. We thought it might break up and with Tredwell and Rabada to face we knew it would be tough, but I’m really pleased we saw it out. “It’s been the story of our four-day season that we’ve had to work really hard for our draws, but we can take a lot of positives from this.